VPNArea Review 2018 – Is VPNArea Safe and Secure? Mandee Rose | Posted on February 28, 2018 March 27, 2019 | 1 Comment on VPNArea Review 2018 – Is VPNArea Safe and Secure? Although owned by a company in Bulgaria, VPNArea has its data and email hosting in Switzerland. The Swiss location may worry those who have looked into the country’s privacy laws. However, VPNArea clarifies that it is not obliged to keep track of users’ activities, because that government requirement only applies to internet service providers. Privacy of activity is of primary concern to VPN users, and if this is a major issue for you, read on to find out how VPNArea gives you anonymity as you surf the web. Busy VPN service that has improved quickly in response to customer demands. VPNArea has attracted some negative reviews in the past, due to server downtime and concerns about the Swiss location of the company’s data center. However, it has addressed most of these criticisms through swift action. Therefore, it is important to note the date on any information you may read about the company. The service started operating in 2012. The internet, privacy laws, and government surveillance methods have all changed a lot since then. VPNArea has adapted and improved in response to this changing landscape. Thanks to efforts to improve its service, VPNArea is often considered nowadays to be one of the top five VPN services in the world. It is one of the cheapest of the best VPN set. 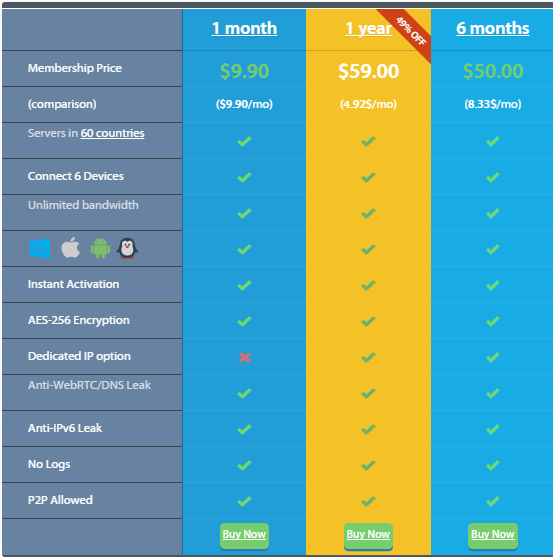 As with most VPNs, access is acquired through a subscription, which is pre-paid. The company offers one-month, six-month, and one-year subscription periods. The one-year rate offers the best value for money, with its price per month working out at almost half the price of the one-month subscription rate. VPNArea doesn’t set up your subscription as a recurring payment, so you won’t get automatically recharged when your subscription expires. This is a relief for those of us who frequently get caught out for not cancelling a service quickly enough. You can pay for your subscription through PayPal, Payza, or Webmoney, or pay with bitcoin. The system accepts credit card processing with 2Checkout, including credit and debit cards covered by Mastercard, Visa, Discover, JCB, Maestro, UnionPay, and American Express. What Features Does VPNArea Have? Your internet service provider (ISP) probably doesn’t make a habit of watching all the data packets of the connections that it provides to its customers. However, whether they like it or not, many are obliged to place filters that block certain types of access. Operators in many companies are even obliged to monitor activities and report certain patterns to the secret service. In some countries, this means that your ISP won’t let you access torrent sites. In other countries, it means you are liable to get hauled off for interrogation. A DNS leak is one way that an ISP can spot what you are up to. The Domain Name Service translates those hard-to-remember IP addresses into web addresses and vice versa. Thus, when you type an address into your browser’s address bar, the browser first of all goes to a DNS server to reference that “.com” into the IP address of the server that hosts the site. Your ISP sees all DNS access and, in many countries, will hand those records over to the secret police at the drop of a hat. VPNArea gives you access to private DNS servers and encrypts and reroutes domain name lookup traffic, so no one can see which sites you are accessing. WebRTC is a Windows feature that flags your location even when you access the web through a server in a different country. Sites that restrict access to their home market can use this information to block access from outside their region. VPNArea defeats this process. A kill switch prevents your computer from connecting to the internet without your VPN being confirmed as active. This feature is particularly useful if you live in a country with draconian internet access laws and you need to mask your activity at all times. The kill switch is an optional feature that can be turned on or off within the user interface. An IP switcher works through a list of IP addresses and changes your displayed home IP address at intervals. This confounds anyone who sees your activities and decides they want to track them. After a short period, the activity on the IP address they are monitoring will go dead. By the time they work out what your new address is, the switch will have already kicked in and moved on to another entry on the list. As with the kill switch, the IP switcher can be turned on or off through the user interface. You can set up a dedicated IP address on your home router rather than getting allocated one of the IP addresses that VPNArea has in its shared pool. As IP addresses work like telephone numbers, the country code is always visible. The private VPN option is a good bet if you travel a lot and want to keep accessing those regional-specific sites that you get onto at home, such as subscription TV services. With the private VPN, your messages are always delivered with the same IP address wherever you are, so you won’t be locked out for being abroad. A port is a secondary addressing system that directs arriving network messages to specific applications. In order to be effective, this port number has to be universally known, and also be embedded in every data packet that services an application’s internet access. Some countries order ISPs to drop any packets containing the well-known ports used by VPN services, thus rendering VPNs useless. Customers in those countries can change the settings of their VPN client to use alternative port numbers and dodge the blockade. VPNArea’s operating location of Switzerland worries some potential customers. The country requires internet services to log and store records of user activity for six months. If the police turn up within that period, they have to hand everything over. This level of disclosure pretty much kills off the privacy benefits of using a VPN. The company clarifies this point, however. VPNArea says that this requirement only applies to internet service providers in the country, not all internet services. It therefore keeps no logs at all. VPNArea hasn’t been prosecuted for non-compliance, so it seems it is right about the extent of the law. You will notice that the First Name, Last Name and Country fields are flagged as optional. This is in response to customers who wanted to be sure of complete anonymity. One requirement of the signup form is that you enter an email address. This could prove to be a privacy flaw. The company points out that it is necessary for them to have a valid email address on file, because this is where they send payment confirmation and account details. If you forget your password during your subscription period, it is to this email address that the system will send a password reset message. The support staff suggests that you should set up an anonymous email account with a webmail server if you want to keep your true identity a secret. Further anonymity can be ensured by paying with bitcoin. 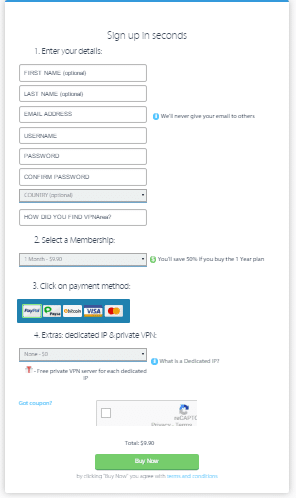 VPNArea does not set up recurring payments, and so their contact with your payment system ends once you have completed the signup process. Once the money reaches them, they have no further use of a record of your funding account. The subscription process at VPNArea is automated, so you don’t have to wait for someone to manually put you on the system. Once your payment finishes processing, you go to the Members Area, where you will find the download buttons on the Setup tab. There are 27 different operating system options. Click on the button for your operating system to get to the install instructions. After clicking on the “Setup file” button, wait for the installation file to download. The installation instructions say to right click the downloaded file and select “Run as administrator.” However, I just double clicked the file to open the installation wizard. This is the standard software install wizard, with which you are probably familiar. Just click through the screens to get the installation going. Once the installation finishes, the Chameleon application will open automatically. If you don’t want to bother playing around with the extra security features and just want to get on with it, select a server from the drop-down list, enter your username and password in the top right hand section of the screen, and press the Connect button. Once the connection has been established, the displayed connection status will change and the top of the panel will display your new IP address and supposed location. When testing the masked IP address, I discovered that even though I had selected a server in Miami, WhatIsMyIPAddress.com reported my location to be in Philadelphia. However, applying the VPN considerably improved my speeds to servers in Miami. These tests are detailed later in this review. Customer support is available through the company website or by email. You will see a small yellow bar in the bottom right corner of the screen. This gives access to live chat. Unfortunately, the help desk is not manned 24/7. Other options are given on the site’s contact page. VPNArea has servers in many locations in the United States. Other countries in the list of operating locations also have a choice of cities. I was surprised, after selecting to connect to a server in Miami, that I ended up with an IP address in Philadelphia. However, connecting from a Caribbean vacation island with lousy local internet service, I found that applying the VPN to a connection to Miami more than doubled available download speeds, although it impaired upload speeds slightly. Yep, the ping is terrible, but the download speed is better than I got connecting to a server a few miles down the road in the first test. This performance was gained while working with the OpenVPN option of VPNArea – this is the most secure, but the slowest of the three protocols that VPNArea offers. Well, the ping got even worse, and the connection speeds are not that great. Even worse, the BBC still wouldn’t let me in because it looks like I’m from Philadelphia, and their geo-location lock only allows access from the UK. So, I am going to reconnect to a server in the UK. Which one? VPNArea has 11 there. Clicking on the Servers & Speed menu option, I can run a speed test and find out which is the quickest right now. UnitedKingdom-London10G looks like a winner. By clicking on that line in the server list and then selecting the Home button, I get back to the main screen of the app, with the UnitedKingdom-London10G server already queued up in the server selection box. Trying again, the results are way better, and tricking the BBC into thinking I’m just in their neighborhood gets me access to all the Dr Who episodes on iPlayer. Well, the no-VPN connection to London is way better than the no-VPN connection to Miami. However, applying VPNArea still made my connection a little faster, and without it, I would not have been let into the BBC iPlayer to watch British TV while enjoying the Caribbean sun. The company promises that it will issue a full refund for those who cancel the service within seven days of taking out a subscription. It pledges that it will refund you within 48 hours. Of course, your bank might add on some delays. I put this to the test: I paid for a one-month subscription with PayPal and cancelled it two days later. I followed the instructions on the VPNArea FAQ page and sent an email to [email protected] I simply stated my username and asked them to cancel my subscription and refund my money. The payment was refunded via PayPal within 19 hours. There is no need to elaborate or make up some complicated story in order to get your money back. Just give your username and ask for a refund in one line. Should I Subscribe to VPNArea? If you live in a country that has terrible internet service, you can actually improve your speeds by connecting through VPNArea – and fool the geo-location locks of sites in your home country.